vCita is a business management and customer service solution created for service providers such as lawyers, educators, accountants, fitness instructors, consultants, and others. It is a cloud-hosted software with tools that help users oversee their daily business operations. 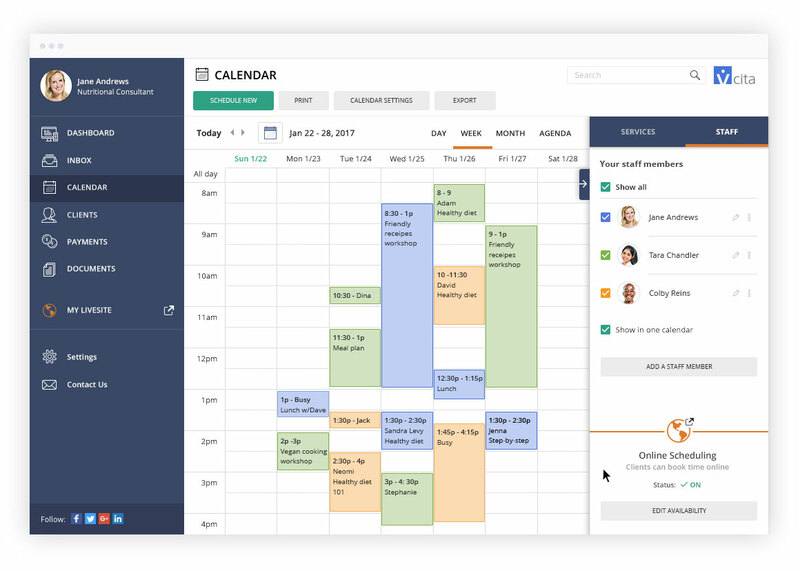 This solution offers businesses a single platform to tackle marketing, CRM, scheduling appointments, booking, and client communication, among others. Whether you are a freelancer or small business owner, this software has you covered. It helps you manage schedules. Its online calendar allows you to organize events and arrange them according to your availability. Its self-service portal lets your customers book services and pay for them through integrated third-party payment gateways. You can even start CRM and targeted marketing activities through vCita and have everything managed in a single place. The software is also available in flexible plans that are tailored to meet the needs of your business. The main benefits of Vcita are its efficient scheduling and booking solution, optimized calendar and client management, trusted payment gateways and empowered marketing efforts. Customers can conveniently pick a schedule and book online. Your customers are also free to choose the most convenient time to receive reminders about their appointments. The software offers calendar functionality that lets your customers book their appointments around the clock. Meanwhile, the software’s teleconferencing service lets you connect with your clients easily. Apart from that, vCita has customized billing and invoicing where you can include your business logo and color to show your branding. Online payment is also convenient as the software is integrated with leading third-party payment gateways. What’s more, your clients can have full control over transactions through a self-service portal. Its LiveSite functionality can help drive higher conversion rates. It is designed to push customers to take action, and it’s responsive to any screen sizes. Making landing pages here is easy and fast. No coding required and no hiring of developers and designers. Furthermore, vCita also assists you in making effective emails and promotions with its ready-made templates. Managing your clients with vCita is also a breeze. It allows you to revolutionize your business into a self-managing platform by having full control over how you deal and communicate with your clients. All information about your clients is stored in a centralized location for easy access and viewing so you can understand their purchasing behaviors. Lastly, visitors can easily connect and converse with you as they check your website through an online form. It has a “Schedule Now” button that can even help you generate more booking schedules.